The Pratt SILS Day of Service with the NYPL Correctional Services Program will take place on Thursday, February 26th, from 1-6pm. Feel free to drop in whenever during that time, but please add your name to the list, so that NYPL knows how many people to expect. For more on what NYPL Correctional Services entails, and how Pratt SILS has been involved, take a look at our post from earlier this week. I think that’s all for this week. Be sure to email us if there’s anything you’d like to see included in the Round-Up, and for goodness’ sake, try to keep warm out there! In anticipation of our event on February 26th, with the New York Public Library’s Correctional Services Department (RSVP HERE), I thought I would round up some resources for students who want to learn more about providing access and knowledge to people who are incarcerated. Circulating book service weekly at five city jails. Each month, 800 to 1,200 people take advantage of circulating library services. Daddy & Me, a book-recording project with detained parents. Incarcerated parents participate in early literacy workshops followed by a session where they create a recording of themselves reading a favorite book to their kids. A weekly book club where incarcerated patrons and staff read and discuss a range of literature in federal prison. Library orientations and library card registrations for men at state correctional facilities. Groups nearing release receive new library cards, information on programs and services at their neighboring libraries. To see all of the resources shared by the ALA about library services to incarcerated people and their families, visit the ALA’s Prison Libraries page. Exploring Prison Librarianship is a blog with articles on experiences of prison librarians, and helpful resources for people exploring this as a career path. Check out their resources page for articles, books, and more information about prison librarianship. Read this article, on In the Library with the Lead Pipe about a volunteer-run prison library service in Winnipeg, Manitoba. Here’s a great round-up of some of the different prison library services offered around the country, from Library Journal. If you want to read more about NYPL’s Correctional Services work and prison libraries, check out their blog! Finally, if you are interested in other local organizations that work to provide access to resources for incarcerated people, check out Books Through Bars NYC. Do you know of a reading, organization, or event that is related to these issues? Tell us about it in the comments! 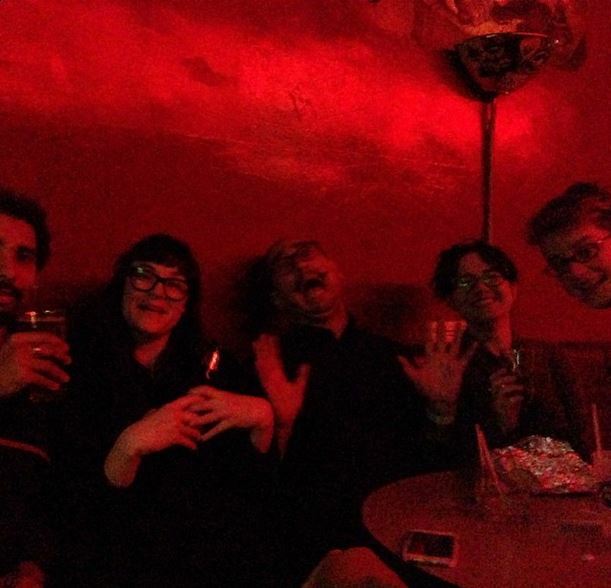 Our Happy Hour last Friday, co-hosted with SAA@Pratt, was tons of fun! We had a great time discussing libraries, archives and Gingerdead Man, starring Gary Busey, which was being ‘screened’ on the wall, to the delight and horror of many! Gosh, look at all these cool and fun Pratt SILS students! The group will be meeting this Saturday, February 14 at 1pm in the PMC Library conference room. If you’re interested in future study groups, you can sign up here. Our blog, Keyword is up and running. You’re reading it right now, in fact! Right now, we’re posting twice a week, including the round-up, but we’d love to do more. If you’ve been to a conference, are working on an interesting project, or just feel like you have something to say, please reach out to us at silssa.pratt@gmail.com, and you, too, can become a LIS blogger! And if you haven’t already, check out this article in Newsweek featuring SILS, Professors Rabina and Drabinski, and all of you who have answered inmate reference letters! Thanks for all you have done, and continue to do! We will be taking a field trip to the Beinecke Rare Book & Manuscript Library at Yale on Friday, February 27th. It will be an all-day event, and space will be limited. We will send out an email with more detailed information and how to sign-up within the next few days, so keep an eye out! The next SILSSA general meeting will take place Tuesday, February 24th, at 6pm in room 610 of PMC. We’ll discuss our upcoming events, and vote on a change to the SILSSA constitution (review the proposed changes here). Our aim is to make this meeting quick and easy, so join us, and don’t worry about being late to your 6:30 class! That’s all from us this week! As always, you can follow us on Twitter for more events and news, and on Instagram for cool pics of those events! If you have something you’d like for us to feature in our weekly round-up, or if you’re interested in writing for Keyword, please email us at silssa.pratt@gmail.com! Hey SILS, I’m Sarah Hackney, and I’m the Secretary of SILSSA! This post is just to tell you a little about me, what I’m all about, and what I’m doing as your Secretary. Let’s see… I’m Sarah. I have purple hair, so if you see someone on the 6th floor with purple hair and probably also an oversize purple sweater, say hi! And if it turns out to not be me, well, you made a friend. And also tell me about it too, I’m curious to know about any doppelgangers I may have out there. 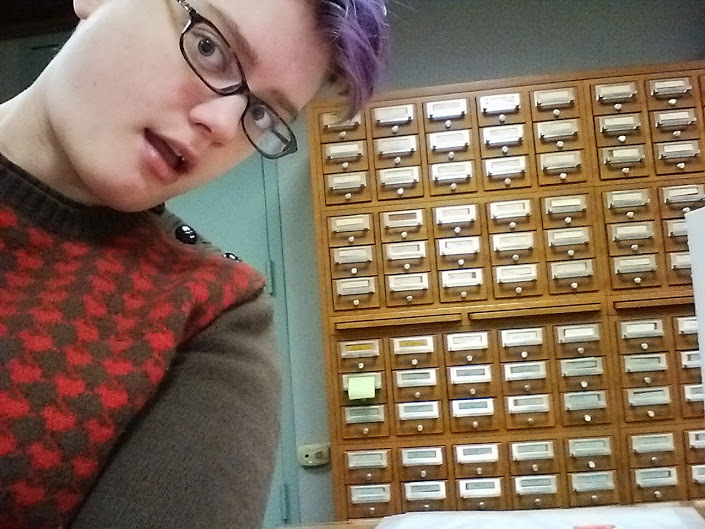 Guys, I am trying to make #cardcatalogselfie happen. As for what brought me to the LIS field, it was honestly kind of a whim. I’ve worked as a barista, park ranger, recipe writer, summer camp program director, gelato shop manager, bread-wrangler, housekeeper and unemployed person. I knew I wanted to go back to school, and I wanted to do something that would let me embrace my wide range of interests. My undergrad degree is in Linguistics, and although I am still totally captivated by that field, I wanted to do something that dealt with actual people and their communications and behaviors in a real, practical way, rather than just a theoretical, systemic way. I thought library school might be the answer. And since I’ve been here, I could not be happier. This is it, for me. And I hope you feel that way too! I’m mega-pumped to be your Secretary this semester, and I hope you’re getting excited about the things that SILSSA is doing. If you couldn’t make it to our first meeting, the minutes are available for you to view online. And if you didn’t come because you thought it would be too long, lemme tell you: 15 minutes flat. And we’re aiming for 10. Ain’t nobody got time for long tedious meetings. Especially not between classes. As Secretary, my main job is communications. You’ll be getting emails from me about upcoming events, and other things going on around SILS. We’re actually proposing some changes to the official job descriptions for SILSSA officers, and you can review them before we vote on them at our next meeting, if you want to see what my job officially is (if the amendment passes). Also, I built you this website! It’s a work in progress, and I’d love to hear your feedback. Even if what you have to say is “It’s ugly and way too yellow.” I know; it’s pretty yellow. I like it, but I want to know what you think. Thanks for making me your Secretary, and I hope you’re as excited about what’s going on at Pratt SILS as I am! SILSSA held its first general meeting of the semester on Thursday, January 29. Eleven students attended, and we discussed a bunch of awesome events we’re planning for this spring. You can read the minutes from the meeting here. We are also proposing some changes to the official descriptions of the duties of SILSSA officers. This is to help clarify officer roles, and to make the description better reflect what we actually do. There will be a vote on the proposed changes at our next general meeting (February 24), so be sure to review the changes before then. We’re applying for the ALA Student Chapter of the Year! We’re proud of what’s happening at Pratt SILS, and we’d like to think that SILSSA is a part of that! We’ll be sure to keep you up to date as this process continues. In that vein, we want to highlight all of the amazing work Pratt SILS students do! We also want to be sure that student accomplishments go recognized within our own community. We’ve created a survey that we would like students to fill out if they were a recipient of an award from a professional library, archive, or museum organization, or if they presented at a professional conference. Thanks in advance! We’ve created a Group Events Calendar, so all the student groups at SILS can better coordinate their events, and so students and faculty can see what upcoming events they might be interested in. Check it out! …And Finally: Happy Hour! Tonight, February 7, starting at 6pm is the first Student Happy Hour of the semester, co-hosted by SILSSA at SAA@Pratt! We’ll be hanging out at Library Bar on Ave A, and we would love to see you there! We’ve got a lot more great stuff coming up, so check back here, on our twitter feed, and on the google group emails to learn more! Hello fellow students! Welcome to the spring 2015 semester. My name is Dinah Handel, and I will serve as your SILSSA president for the semester. I couldn’t be more excited to be a part of SILSSA for a third semester, and in a new capacity. In this inaugural post on our new website, I want to introduce myself, talk about some of the upcoming events we have planned for the semester, and also speak generally to some of the goals we want to accomplish as a student group this semester outside of event planning. First, a little about me! This is my fourth semester at Pratt SILS. I study archival processes and theory, mostly, but with a side of critical pedagogy, and an emphasis on the digital side of librarianship. I am also invested in the intersections of issues of race, gender, class, and sexuality, with librarianship, which is an emerging field within our discipline. I am happy to talk any time about all of these topics! 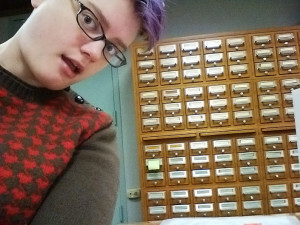 I work at Pratt as a graduate assistant, and at Barnard Archives and Special Collections as a graduate fellow. When I am not working, I like binge watching sitcoms, relaxing with my friends, and when it is warm, sitting in the park! Zine workshop: Zines, which are do it yourself (DIY) magazines, are a really fun way to share ideas and thoughts, politically express yourself, or just have fun and make art. Zine culture and librarians intersect a lot, and many libraries and archives carry zines! This workshop will provide a fun and supportive environment for SILS students to creatively express themselves, and get to know one another! If you want to learn more about zines and libraries, may I suggest reading more about the Barnard Library Zine collection? Day of Service with the NYPL: Recently, Newsweek published an article about the NYPL’s Correctional Services department, and the Pratt SILS students who answer reference questions for incarcerated patrons. We have teamed up with the Correctional Services department for an afternoon of service, in late February. This event is a great way for students to volunteer their time and skillset for a social justice cause. Tour to the Beinecke: Each year, SILSSA tries to take students on a field trip outside of New York City, to a notable library or archival institution. This year, we are planning a trip to the Beinecke Rare Book and Manuscript library at Yale University. The tour will take place in Late February or early March, and SILSSA will pay for the cost of transportation. Public librarianship panel: The New York City area is home to amazing library systems: NYPL, the Brooklyn Public Library, and the Queens Library. We are hoping to bring together practitioners from different library branches and areas for an informative panel for those considering a career in public librarianship. If you’re a public librarian and interested in getting involved, email dhandel@pratt.edu! Gender and Intersectionality in Library and Information Science event: This year, we will host a panel on issues of gender, sexuality, race, and class and the intersection of librarianship. The details are still being worked out but it will take place in late March! For context, check out the Gender and Sexuality in Information Studies colloquium that took place in October of 2014! Wikipedia editathons: Last semester we hosted a wikipedia editathon about the history of the Pratt SILS program. It was a really fun and educational event! We are hoping to do another editathon this semester, the topic of which is undecided at this point. Have any ideas? Feel free to email dhandel@pratt.edu! Happy hours: We try and encourage socializing outside of the 6th floor lobby of Pratt Manhattan, by hosting happy hours at a variety of locales in New York city. Friday, February 6th will be our first happy hour, at the Library bar. We will be there at 6, and we hope to see you! I think that about wraps it up for upcoming events that we already have in the works, but there will definitely be more to watch out for, especially those organized by fellow student groups! As for the vision for SILSSA for the upcoming semester, we have a few items we want to get in order. First, we want to hammer out the job descriptions and responsibilities of SILSSA officers. Because SILSSA acts as more of an umbrella organization, despite being affiliated with the ALA, it can sometimes be difficult to define what we do. That being said, we are committed to greater transparency about our job positions, and to that end, we have rewritten them and made them public for comment, and will be voting on them at our next general meeting, on February 24th! In addition to greater transparency, we are also committed to increasing inter-student group communication at Pratt SILS. Too often the Pratt SILS community can feel fragmented, or nonexistent, and with the plethora of events organized individually by student groups, attendance is lowered. With this in mind, SILSSA wants to increase communication between student groups through a shared student leader calendar, and strategize with student groups to co-host events and increase student attendance at events, thereby strengthening student community. Finally, SILSSA wants to try and work with Pratt Institute and Pratt SILS to acquire more funding for students who present at conferences. SILSSA recognizes that Pratt SILS students are contributing to the LIS discipline through their original scholarly work, and we want to support this! This is one of our loftier goals, but we are committed to advocating on behalf of the student body for more conference funding. I hope that you’ll join us for any, or all of our upcoming events this semester, and please don’t hesitate to reach out in the comments, or via email. Thank you!